Congratulations and welcome to the 12 new members of the San Jose Scottish Rite. You are to be commended on your travels through the degrees and orders of Freemasonry. Only through active participation will the lessons taught in the degrees be further experienced. One avenue for active participation is in the San Jose Chapter Knights of Saint Andrew. The KSA meets on the first Monday of the Month at 7:30 PM in the Scottish Rite Center. All Scottish Rite Masons are invited to attend. The meeting is under the direction of Chief Knight, Gerald Best. Meetings address, bi-law changes, current events in which we are invited to participate and inducting new members who would like to be of service to the Scottish Rite. 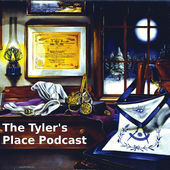 Areas of service include, but are not limited to, Cast members for Degrees portrayed in Spring and Fall Reunions; support crews for all degrees; Parades like the Veteran's Day parade and Fourth of July, Greeters for the Scottish Rite Stated Meeting and all other official functions of the Scottish Rite. Roles for the 29th Degree, Scottish Knight of Saint Andrew, are primarily comprised of members of the Chapter. The 29th Degree costuming is Scottish Kilt, kilt shirt, kilt hose, wide belt with sword and Glengarry. Knights have also participated in private activities, mainly for our brethren, such as weddings, receptions and knightings. Knights of Saint Andrew are easily recognized at Scottish Rite Functions by the Scottish red and white checkered Glengarry. Members who are Knight Commander Court of Honor members or Fifty year members wear hackles of red or blue colors in their Glengarry. Chapter officers wear black hackles in reflection of their hat color. The Chief Knight wears a Black and a white hackle as a mark of his office. 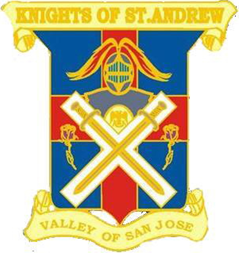 The San Jose Knights of Saint Andrew have a presence on "Facebook." The only requirement for membership is that one be a Scottish Rite 32nd Degree Mason. If you have an interest in service to the Scottish Rite and your community, contact any Sir Knight. The Director for the 29th Degree is searching for Bagpipe player(s) and drummer(s). Pipers and drummers must be Scottish Rite 32nd Degree Masons and be adept in playing Celtic music to accompany a theatrical performance. Interested persons should contact the degree director.